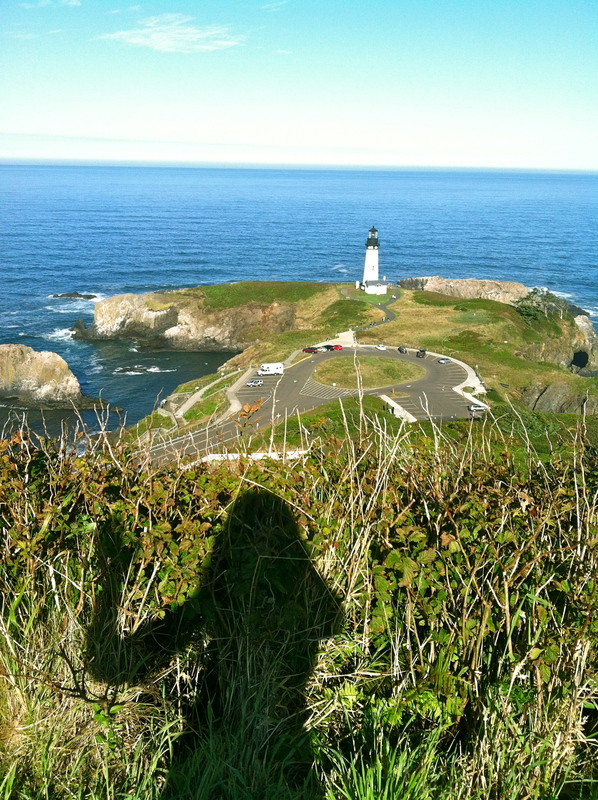 It is the last week of working at Yaquina Head and emotions are fluttering. There is so much to be thankful for and so many people that will be missed. During the last week I was preparing for my last walk, a wildlife walk that integrated stories from lighthouse keepers’ interaction with nature in the 18-1900s. This was part of the 140 years lighthouse celebration program. The walk took place on Saturday, the last day I would be working a Yaquina, at 8:30am to two small groups of nine visitors. As I roved around the site, it was the perfect way to say goodbye to such beautiful place. Great Blue Herons, Brown Pelicans, and Harlequin Ducks, were observed along with the nesting cormorants practicing flight and swimming, and the resident harbor seals. It was a gorgeous day, with the brightest blue ocean and an unusual but pleasantly warm weather. After the walk I continued to walk along the park thinking back on my experience. It is incredible the amount of knowledge I have gained in the past six months. I have had the most delightful experience learning about what I love and doing work I love. Seabirds, shorebirds, passerines, marine invertebrates, whales, pinnipeds, sea otters, lighthouses, and marine and coastal conservation issues are topics I knew little to nothing about and now I have led walks, programs, surveys and helped with research surrounding them. It’s incredible. I feel so blessed to have gotten this opportunity. Reaching out to the local Latino community felt like I was really making a difference by bringing awareness about the local birds and the issues surrounding them. There is not one thing I didn’t like, and yes, at times I was stressed…but I wouldn’t change anything. At this time during my walk I felt accomplished. But later, I began feeling melancholic for all the sightings I would no longer see, for the breeze I would no longer feel, the birds calls I would no longer hear, and of course the people I now had to say goodbye to. I am never going to forget all the wonderful people I have met through this internship. From the Latino interns during training, to the BLM and USFW volunteers, to my co-workers and supervisors; they are amazing citizens of the world. I admire their passions, their drive, and their willingness to give and reach out to others. It has been very pleasant to be surrounded by them and share the mission of protecting wildlife and its environment. Thank you from the bottom of my heart to everyone and every creature who made this experience possible.